For readers of the site, it comes as no surprise that I have been anxiously waiting to get my hands on Professor Layton and the Unwound Future. This puzzle-solving series from Level-5 is one of the best hand-held franchises available, and Professor Layton and the Curious Village is now securely in my top ten most enjoyable gaming experiences. Despite the time I have put into the previous two titles, there is something curious about the way players interact with the two dimensional environment I had not noticed until now. Simply and subtly, Level-5 conveys a better sense of three dimensional space without ever breaking the cheery animated style of the games. 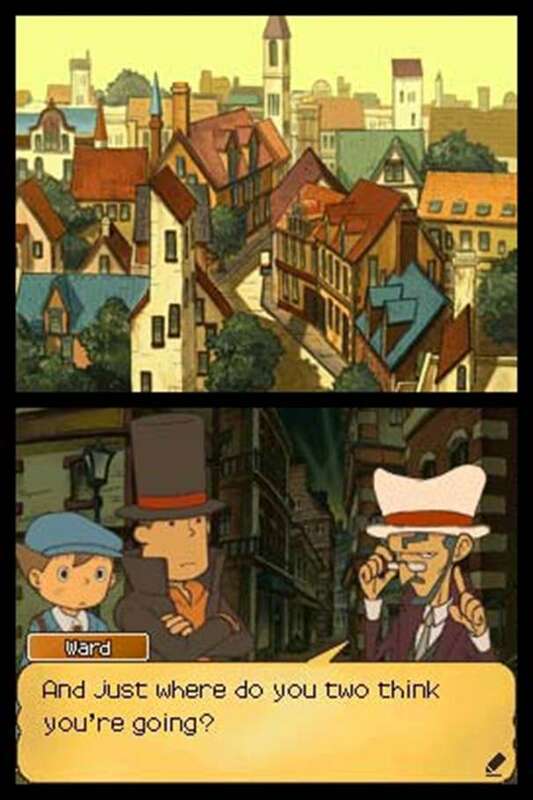 The animation style of Professor Layton has always been top-notch, and the drawings that make up each map are colorful and rich with detail. That being said, traversing the urban environments can seem flat at times. Each area is represented by a simple splash screen. To interact with people, you simply tap the stylus on their person. The same action is used when searching for hint coins hidden in the environment - stashed away in a lamp post here, a flower pot over there, etc. Each time you tap a part of the screen, a small yellow circle expands, indicating the place you touched. When scanning an area for hint coins, you can get caught in the habit of tapping all over the screen randomly, poking and prodding at the environment for a coin. Yet all these actions are repetitious, and the little, flat, unchanging circle expresses the two-dimensionality of the world. Looking for hint coins is akin to tapping at a paper print out of a city. I think Level-5 was aware of how such actions could be boring and detrimental to the feel of the game. To make up for this, they added dialogue boxes that pop-up when the stylus touches certain objects in the environment. 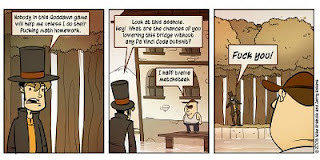 Prof. Layton or Luke, when touching a street light, might comment on the lighting in the area, for example. These bits of optional conversation not only flesh out the relationship between the Prof. and his apprentice - they do share banter after all - they also convey a sense of physical space within the two-dimensional portrait. Many of the pop-up dialogues imply a physicality to the environment. When touching your stylus to a gate, Prof. Layton warns Luke not to touch it lest his hands get smudged with soot. When tapping on a puddle, Luke will say something about almost falling in and getting his feet wet. There are times where Luke will even chide Layton for trying to enter a building when he should be more careful. Similarly, certain objects will react slightly differently when touched. A water fountain, for example, makes a splashing sound when tapped and the yellow circle becomes ringed with the splash of water droplets. Touching the fountain in front of the Casino in Unwound Future has no mechanical benefit, but doing so implies a degree of physicality not easily conveyed when exploring a two-dimensional space. None of this is to say the game is immune to the tedium of poking a bland environment. For some, the little measures taken by Level-5 to enliven the experience are not enough. I, however, just fall more enthralled by the simple artistic style of Professor Layton and its ability to maintain my curiosity without crowding the experience with needless complexity. You blew my mind. Now I'm poking everything and its even better. This is Sue. I know Hannah from CAL. I haven't played the new one yet, but I can't wait. Do you go back to finish all the puzzles after you finish the game? I'm glad you enjoy the series as much as I do. I tend to go back for a few puzzles after I finish the game, yes, but never for very long. Without the story attached to it, the puzzles feel more like work. I'm not entirely sure that's a bad thing.